"A finalist in the 2000 Share The Very Best Recipe Contest, this recipe was entered by Alma Carey of Sarasota, FL. 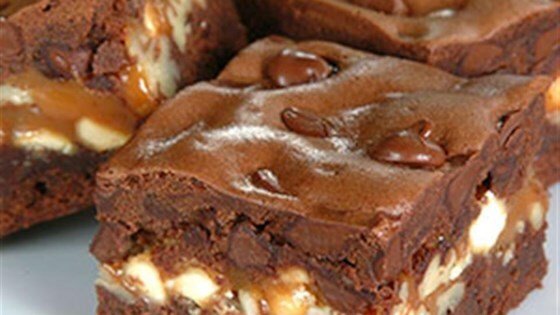 Made with a genuine love of chocolate, this decadent brownie features vanilla-flavored white and semi-sweet chocolate morsels, chopped pecans and caramel layered within a rich cocoa batter." I wanted to use a 13x9 pan so I doubled the recipe and it was fine. If I did it again I would decrease the caramel by 25% so the cake doesn't drip over. Every body totally loved these brownies. These are my boyfriend's favorite! He asks me to make them all the time! Turned out fantastic! I will definitely make these again without adjustments.